At Jonesboro’s Tacos 4 Life, customers can satisfy their own hunger with a tasty taco while also feeding a malnourished child who could be continents away. The restaurant’s unique mission makes customers feel good about their purchase. For every meal bought at Tacos 4 Life, a meal is donated to a child in need. Robin Nix Sr. opened the Jonesboro location in November 2017. 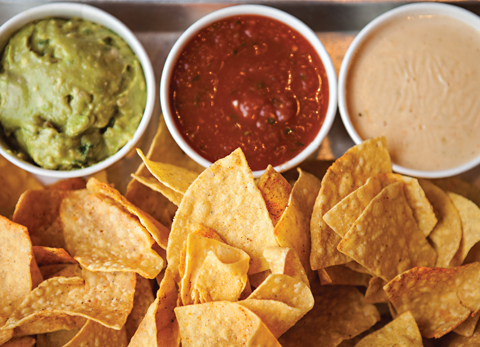 He teamed up with Tacos 4 Life founders Austin and Ashton Samuelson of Central Arkansas to become the company’s first franchisee, and Jonesboro became home to Tacos 4 Life’s seventh location. Although the company is growing quickly and has a promising future, it had a humble start more than seven years ago in Conway as a pizza restaurant launched by a young couple dedicated to fighting hunger. Compassion for starving children and determination to help them has always been the driving force behind Tacos 4 Life for founders Austin and Ashton Samuelson. Their mission began when, while living in Los Angeles, they were confronted with extreme poverty and learned a simple, yet heartbreaking statistic: 18,000 children around the world die from starvation each day, yet starvation is the most solvable crisis. The Samuelsons were instantly struck by the urgency of these facts and felt led to personally make a difference. After moving back home to Arkansas, they pondered ways to combine their love for food and dining with their passion for ending worldwide hunger. While brainstorming, the couple thought about the business model for Toms shoes—for every pair bought, one pair is donated. The Samuelsons then decided to open a restaurant in Conway using the same model, donating a meal for every meal bought in the store. They chose a pizza eatery and named it Pitza 42. The Samuelsons found the perfect organization for Pitza 42 to partner with in order to accomplish their goal of fighting hunger: Feed My Starving Children. For every menu item sold, the restaurant donated 22 cents, the cost for Feed My Starving Children to produce one Manna Pack. These Manna Packs, made up of rice, chicken, soy and vegetables, are scientifically developed by the organization to meet the needs of severely malnourished children in more than 60 countries. With a solid plan of action for feeding their community and feeding starving children in other countries, Austin and Ashton got to work. The Samuelsons didn’t let their inexperience stop them, however. Pitza 42 opened in Conway in September 2011. After a couple of years of success with the venture, they took a team to Africa in 2013 to get a real, hands-on look at the impact Feed My Starving Children had on the kids who needed it most. Here, Austin and Ashton had a life-changing experience that was the catalyst for a big change in their business. The Samuelsons had the opportunity to personally feed Manna Packs to children from a village in Africa one day on their visit. Ashton described how the kids lined themselves up, with the youngest going first, and the oldest boys, around the age of 12, at the back. As the line neared the end, however, Austin and Ashton realized that they were running out of food. They began to give smaller portions, but still ran out with more children to feed—and no more Manna Packs to be had. The Samuelsons returned home from Africa more determined than ever to find new ways to donate as many meals as possible to starving children. They realized that although they were able to donate a meal for every pizza bought at Pitza 42, some cuisine lent itself to customers buying multiple menu items at once. With tacos, they would be able to donate a meal for every taco bought, and many customers will buy multiple tacos during one meal. With this realization, Tacos 4 Life was born. 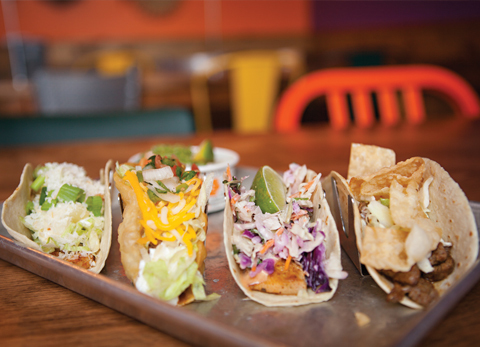 The Samuelsons transformed Pitza 42 into Tacos 4 Life and opened a second Tacos 4 Life location in Conway in June 2014. From there, they continued to open restaurants all around Arkansas—in Fayetteville, Little Rock, Benton, Springdale and Rogers. 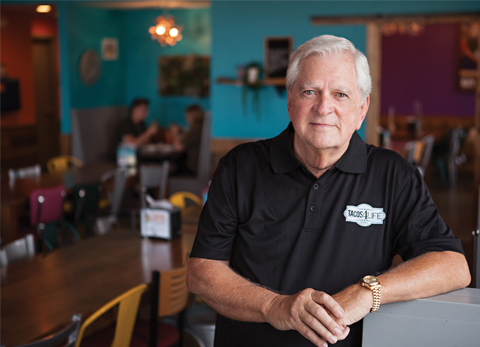 Nix, as the first franchisee, opened stores in Jonesboro and Searcy. Tacos 4 Life then began to expand outside the state, with locations in Frisco, Texas, and Concord Mills, N.C. New locations are coming soon in Fort Smith; North Little Rock; Jackson, Tenn.; and Waxahachie, Texas. Austin and Ashton have no plans of slowing down any time soon. Jonesboro has certainly welcomed Tacos 4 Life with open arms. Nix has been pleased with the overwhelmingly positive response from the community since the store opened in November. “After we opened the first store, after the first week, Austin called me and he said ‘I want to put this in perspective for you. With the meals that you donated the first week, that will feed nine children for a year.’ That’s quite a bit of difference,” said Nix. In addition to supporting Tacos 4 Life by dining in the restaurant, the community has shown its support through volunteer work at Feed My Starving Children’s Mobile Pack. At this two-hour volunteer session, participants assemble the ingredients of Manna Packs to be sent out to children in need. Jonesboro’s Tacos 4 Life hosted its first Mobile Pack last spring and experienced a great volunteer turnout. Nix truly believes in the mission of Tacos 4 Life and sees a bright future ahead for the company. Tacos 4 Life is located at 2929 Parkwood Road in Jonesboro, near Academy Sports. They are open from 11 a.m. to 9 p.m. Monday through Thursday and 11 a.m. to 10 p.m. Friday and Saturday. For more information, call (870) 938-0250, visit tacos4life.com, or find the restaurant on Facebook (Tacos 4 Life), Twitter or Instagram (@tacos4lifegrill).